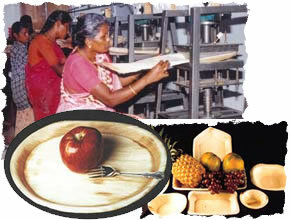 One Areca leaf plate manufacturing unit. Needs 70,000 leaves per year. In this scenario near about 80,000 plates manufacturing units can be established all over India. 3 lac fresh employments can be given in 80,000 units. This Particular project can create A Rural employment revolution in India. At present only 3,000 units are established all over India, in this 2,500 units are established by Eco Green unit for self help groups, small entrepreneurs and farmers in India. This particulars project has been developed before 9 years. This project has been aimed as a community based development programme, income generating Activity, poverty alleviation programme.